Given that it’s one of Mexico's most-visited beach destinations, Cancun leaves nothing out when it comes to entertaining little (and big) people. We visit the north-east corner of Mexico’s Yucatan Peninsula to check out 10 of the best all-inclusive family hotels who make it their business to go above and beyond for you and your brood. The scene: With the sparkling white sands and the glittering Caribbean waters as a striking backdrop, this parent-approved newcomer raises the bar for a spoiling stay in Playa Mujeres. What sets this place apart from the rest is its supersized pool area, head-spinning amount of sophisticated wining and dining options, waterpark with slides, water jets, and splash buckets, and 502 luxury-filled suites - the most salubrious of which have Jacuzzis and swim-out pools. Best for kids: The supervised Explorer’s Club keeps kids aged three to 12 busy for hours with exciting activities themed around science, nature, and exploration, while the Core Zone Teen's Club presents too-cool teens with a selection of team sports, games, bonfires, and discos. The ultimate thrill is the Delphinus® Dolphin Habitat where swimming, dancing, hugging, and feeding the cute and clever dolphins is on every child’s wish list (extra charges apply). 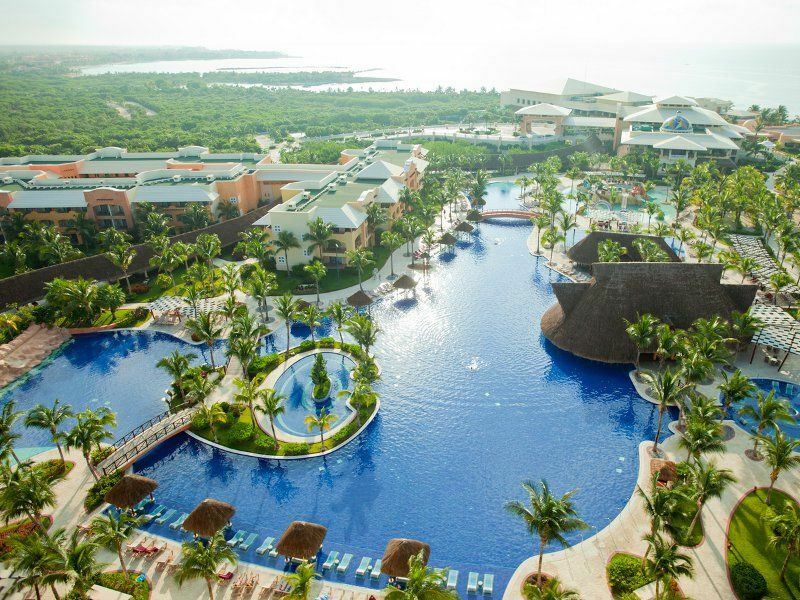 Best for parents: Grown-up time away from the kids can be spent on the Greg Norman signature 18-hole course at the Playa Mujeres Golf Club or at Dreams Spa by Pevonia® - a 16,000-square-foot space complete with sauna, steam rooms, beauty salon, state-of-the-art gym, relaxation lounge, and 12 treatment rooms. There’s also seven à la carte dining spots, a buffet and grill, a café with ice cream parlour, and 13 bars and lounges for unlimited drinks. The scene: Striking the right balance for both children and parents, this fun-filled property enjoys a prime position on one of the Riviera Maya’s finest beaches. There’s six buffet and à la carte restaurants serving global-spanning cuisine, a shopping centre, an excellent gym, three well-sized sized pools (including shallow areas for kids), and 756 Caribbean-style rooms with king-size beds, private terraces or balconies, and spacious bathrooms with rainfall showers. Best for kids: The Barcy Kids Club entertains children aged four to 12, while the Teen Club holds the interest of hard-to-please teens. Highlights include an 18-hole miniature golf course, four-lane bowling alley, waterpark with castles, slides, and waterfalls, and Surf Rider wave pool (age restrictions may apply). Older kids will like playing video games at the family-focussed Strikers Sports Bar or dancing the night away at the no-parents-allowed One Disco Club. Best for parents: Sporty types will have a blast choosing from a huge range of land and water activities. There’s two tennis courts, two paddle tennis courts, a professional-sized football pitch, a gym with spinning area, and an on-site Dressel Divers Club for diving, snorkelling, and watersports (charges may apply). You can also book a babysitter to steal a few hours away at the blissful U-Spa, the adults-only Jaguar's Nightclub, or one of the late-night bars and lounges. The scene: Discover this bright and beautiful hotel’s Unlimited-Luxury®, boasting wonderful benefits including unlimited decadent cuisine at five brilliant restaurants, such as Bluewater Grill’s succulent seafood, and Lemongrass’ fun and interactive Teppanyaki tables. Families will love the pops of colour in the contemporary suites, and the main pool adorned with shaded cabanas. 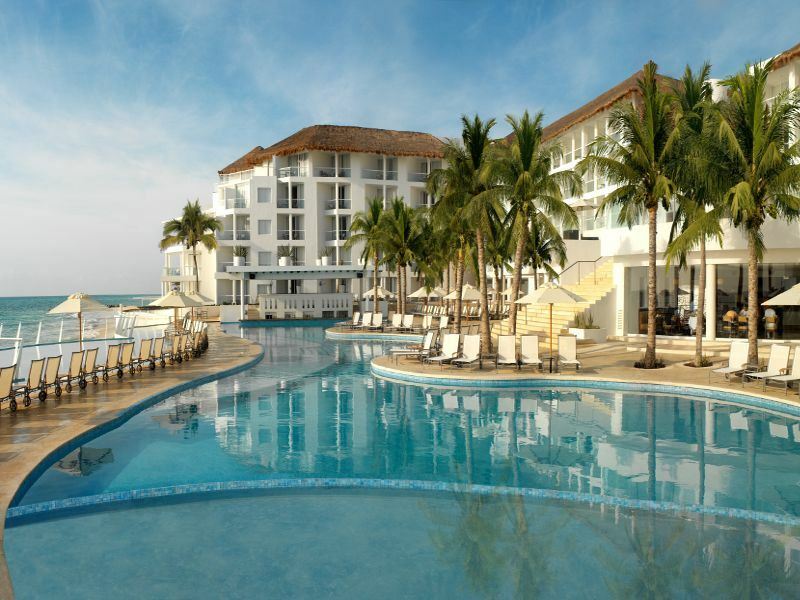 Best for kids: A choice of three lovely pools is a sure-fire way to get the kids excited, and with restaurants including a poolside barbecue and a vibrant Mexican eatery, there’s plenty of choice for even the fussiest of eaters. The Explorer’s Club offers children aged 3-12 hours of crafts, games, camping and movies on the beach. Best for parents: While the kids are making new friends at The Explorer’s Club, mum and dad can hide away in the adult-only pool, taking advantage of the Unlimited Luxury® pool and beach wait service. There’s also the idyllic adult-only Paramour restaurant, serving divine French cuisine. 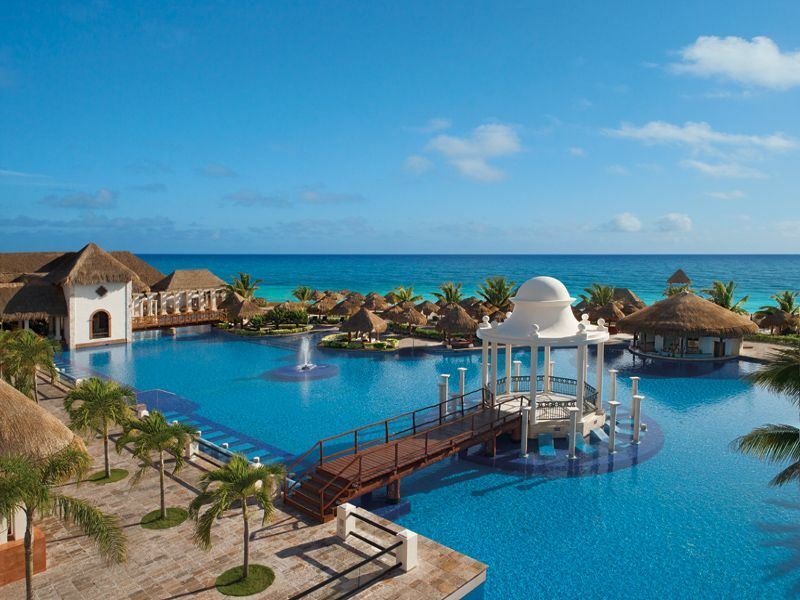 The scene: The wow-factor is high at this supersized 2,438-room resort only 10 minutes from Cancun’s Hotel Zone. Divided into three separate sections (Sunrise, Nizuc, and Grand), it offers vast expanses of gardens and pools, a dozen restaurants and bars, floodlit sports courts, and two high-tech gyms. For grown-ups, the unlimited golf at the 27-hole Jack Nicklaus signature course and the divine beauty treatments at the Awe Spa are the obvious draws. Best for kids: Designed for kids aged four to 11, The Playroom (based at Nizuc and at Sunrise) has games rooms (including a fashion room and beauty salon), a dollhouse area, a creativity zone, and a waterpark. There’s also an Xbox room, a simulated race area, a theatre for live performances, and two playgrounds (one indoor and one outdoor). Teenagers can hang out at Wired - a trendy lounge with video console games, an arcade zone, and a fully-stocked soda bar. Best for parents: All three sections have an international buffet restaurant serving breakfast, lunch, and dinner. There’s also a superb choice of casual poolside eateries and swim-up bars as well as plenty of à la carte spots, including pan-Asian cuisine at Momo, local Maya fare at Riviera Maya, and Brazilian steak specialties at Arrecifes. The adults-only Sky Bar, the Brit-style pub, and the glamorous on-site nightclub are also worth booking a babysitter for. 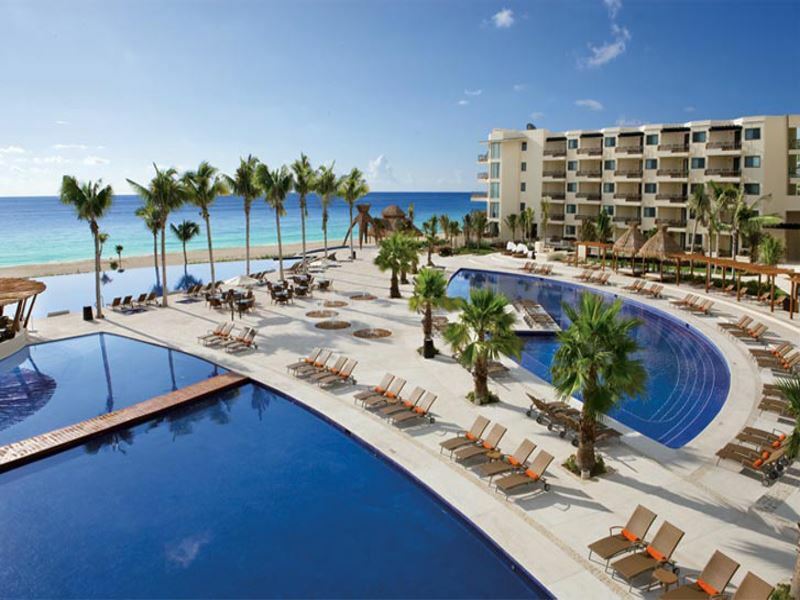 The scene: Just a hop away from the bright lights of Cancun and Playa del Carmen, this family-friendly resort set along a white-sand beach in the Riviera Maya has pretty much everything for even the youngest of guests - but without compromising on fabulous facilities for grown-ups. 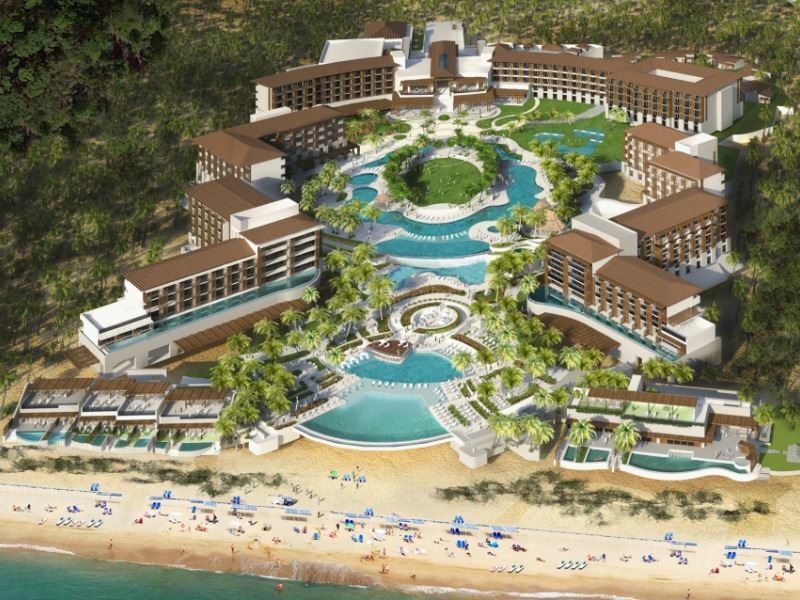 There’s 486 rooms (many of which are octagonal-shaped and have private plunge pools), nine gourmet restaurants and six bars, a selection of heated pools, and an ocean trampoline. Best for kids: Catering for kids aged three to 12, the supervised Explorer’s Club has daily science, nature, and exploration-based activities, a planetarium, and a Chichen Itza-style pyramid climbing wall. There’s also a couple of heated pools, a dedicated teen zone, and a wealth of mini-me pampering treatments (hair braiding, manicures, pedicures, skin-specific facials with papaya or strawberry, chocolate body wraps) at Dreams Spa by Pevonia®. Best for adults: Those who like keeping busy are well served with three pools (two of which are heated), two outdoor Jacuzzi’s, and a choice of water and land activities such as scuba diving, kayaking, sailing, beach volleyball, cocktail-making classes, and yoga sessions. 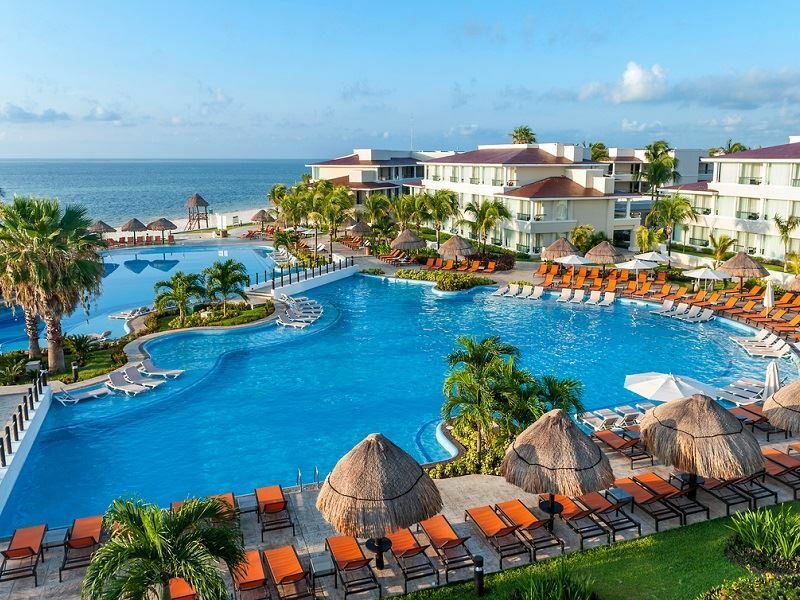 The resort’s Unlimited-Luxury® package also includes around-the-clock room service and exciting after-hours entertainment such as movie screenings, Mexican bingo nights, and weekly beach parties. 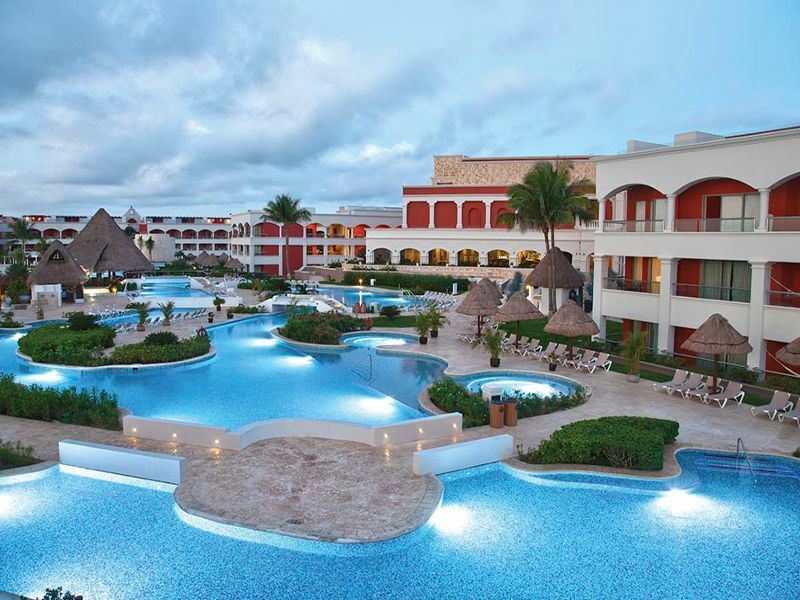 The scene: It’s all about living life large at this action-packed resort that brings the luxe factor to the Puerto Aventuras shores with inviting design, exclusive saltwater areas, and legendary Hard Rock hospitality. There’s two lagoon-style pools with a splash park and waterslides, four adult-only pools, a wealth of wining and dining options, and 687 rock star-worthy rooms with private balconies or terraces, flatscreen TVs, good-looking bathrooms, and all mod cons. Best for kids: The well-planned kids club gives parents a break by keeping little rockers aged four to 12 entertained with singing, dancing, building, dressing-up, and fun play in the dance studio and construction zone. Tweens (six to 13) and teens (14 to 17) are also in for a treat at the Cavern - a cool lounge complete with climbing wall, air hockey table, pool table, TV for movie screenings, and selection of up-to-the-minute video and Xbox 360 games. Best for adults: You’ll find plenty to drag yourself away from your sunlounger for; mostly the daily classes, yoga temple, and top-notch cardio equipment at the Body Rock® Fitness Centre, and the steam rooms, hydrotherapy current pools, meditation pond, and personal spa butlers at the music-centric Rock Spa®. There’s also the signature Sound of Your Stay® programme - a hands-on experience that allows you and the kids to channel your inner rock star. The scene: Sitting pretty on a two-mile stretch of sugar-white sands and backed by a 44-acre garden landscape with 5,000 native plants, this low-rise resort is only five minutes from the 1,000-year-old ruins at Tulum. 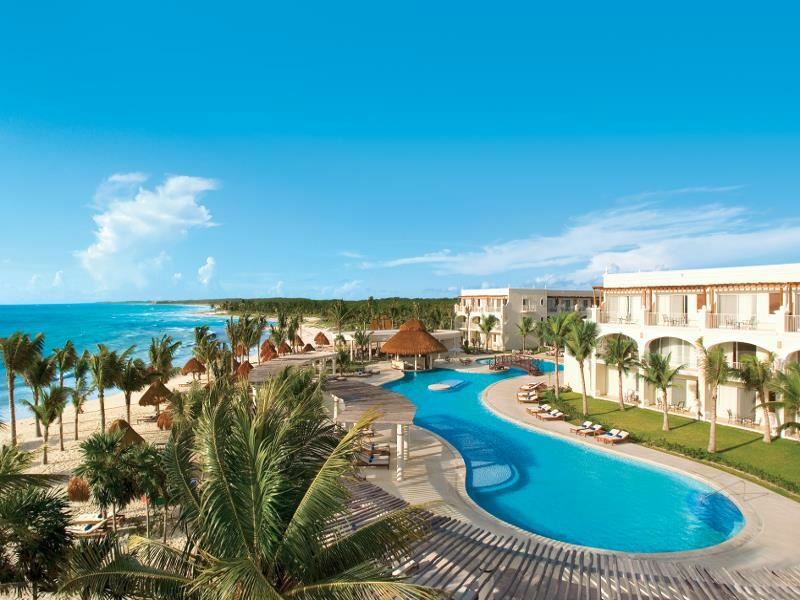 There’s 431 rooms and suites divided into two sections (hacienda-style or contemporary), two fabulous pools (one with a kids’ section and swim-up bar), and a reliably good selection of restaurants and bars included in the Unlimited-Luxury® package. Best for kids: The supervised Explorer’s Club caters for kids aged three to 12 with daily science, nature, and exploration-based activities as well as a brand new, state-of-the-art water playground with six slides and an outdoor wet play area. Older kids aged 13 to 17 can escape their parents by hanging at the Core Zone Teen Club – a cool-looking space with plasma TVs and DVDs, Xbox One and PlayStation 3 consoles, table games, and a bar serving non-alcoholic drinks. Best for adults: Spanning nearly 13,000-square-feet, Dreams Spa by Pevonia® has a selection of beachside palapas and jungle cabins for treatments, a hydrotherapy room, Swiss showers, and a spa pantry where you can create your own products. Further thrills include hitting the beach to watch baby sea turtles taking their first steps (July to December only), enjoying weekly themed dinners, and sipping limitless cocktails at any number of bars once the kids are in bed. 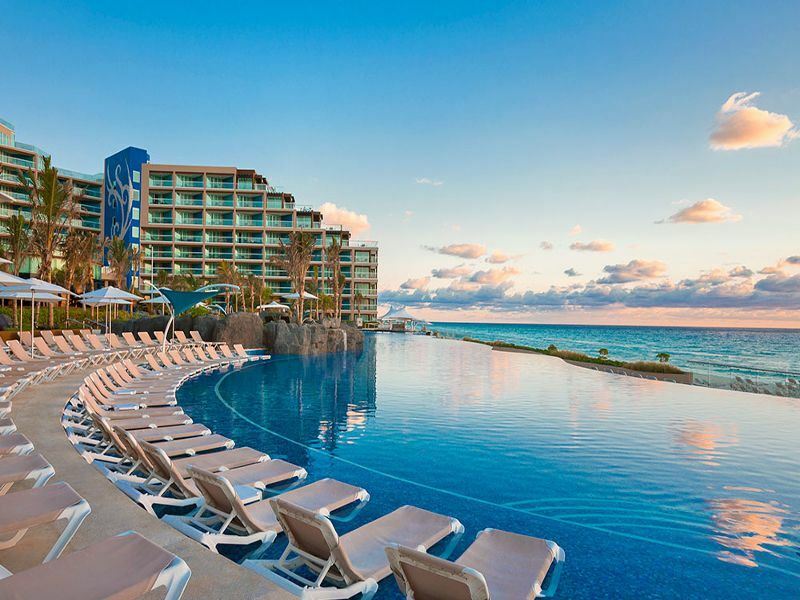 The scene: With a big push on checking in and rocking out, this luxury-filled resort is set on a brilliant white beach in the centre of Cancun’s Hotel Zone. Channelling glitz, glamour, and music memorabilia like nowhere else, you can expect rock star-worthy rooms with private hydro spa tubs, a massive infinity pool with swim-up bars, exceptional wining and dining options, and a music lab where you and the kids can form a rock band and perform in front of other guests. Best for kids: The well-planned kids club gives parents a break by keeping little rockers aged four to 12 entertained with singing, dancing, building, dressing-up, and fun play in the dance studio and construction zone. There’s also Ultimate Playtime Packages that offer extended babysitting hours, free gifts, and personalised amenities for babies up to 18 months, toddlers aged 18 to 36 months, and kids aged three to 12 (there is an extra charge for this service). Best for adults: Given that it has seven bars and lounges, you won’t be stuck for places to relax with a fine bottle of vintage wine or hand-crafted cocktails. Equally impressive are the soul-soothing treatments at the music-centric Rock Spa®, the fabulous makeovers at the Posh® Beauty Salon, the state-of-the-art cardio and circuit equipment at the Body Rock® gym, and the limitless tee times at the Riviera Cancun Golf Club and the Hard Rock Golf Club Riviera Maya. 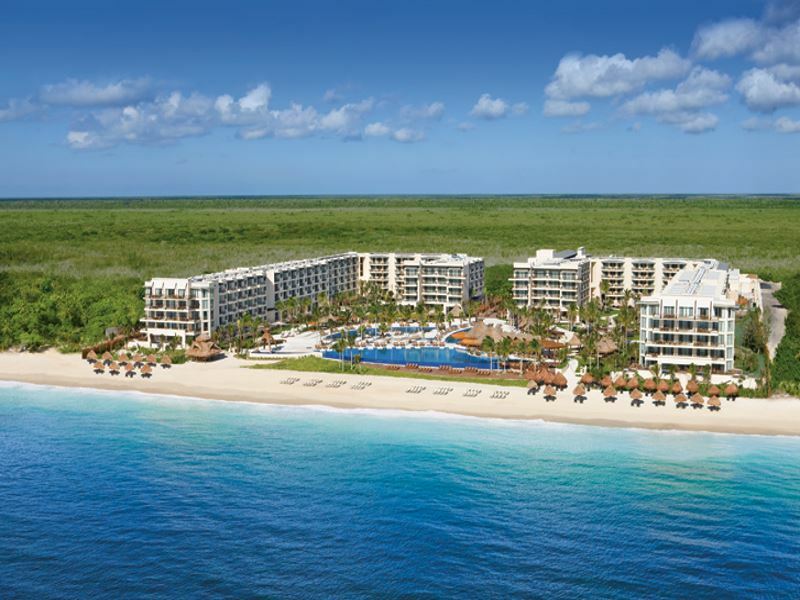 The scene: Delivering ocean-kissed opulence in a tropical setting beside the glistening turquoise waters and powdery white sands of Playa del Carmen, this laid-back resort is abuzz with families for good reason. There’s 208 stylish and spacious rooms with double whirlpool tubs, a well-sized outdoor pool with a kids’ section and swim-up bar, an appealing choice of bars and restaurants, and an attentive round-the-clock service that leaves you wanting for nothing. Best for kids: Children aged four to 12 can make new friends at the Playroom - a supervised club supervised by professional staff. Older children can stay up late to watch one of the amazing nightly shows, or accompany their parents to a tour of nearby Quinta Avenida (Fifth Avenue) - Playa del Carmen’s famous three-mile shopping strip that comes alive at night with lively town square-style street entertainment, trendy late-night bars, and chic dance clubs. Best for adults: The Awe Spa has plunge pools, herbal steam rooms, a hydro section with a revitalising shower, hot tub, sauna, cool and warm lagoons, and treatment rooms for hydrating body wraps, deep-tissue massages, luxurious facials, and much more. For after-hours chillout, the chic Luna Lounge serves Thai delicacies, masterfully-crafted cocktails, fine wines, and branded spirits (Jack Daniels, Johnnie Walker, Smirnoff, Presidente, Havana Club) until 1am. 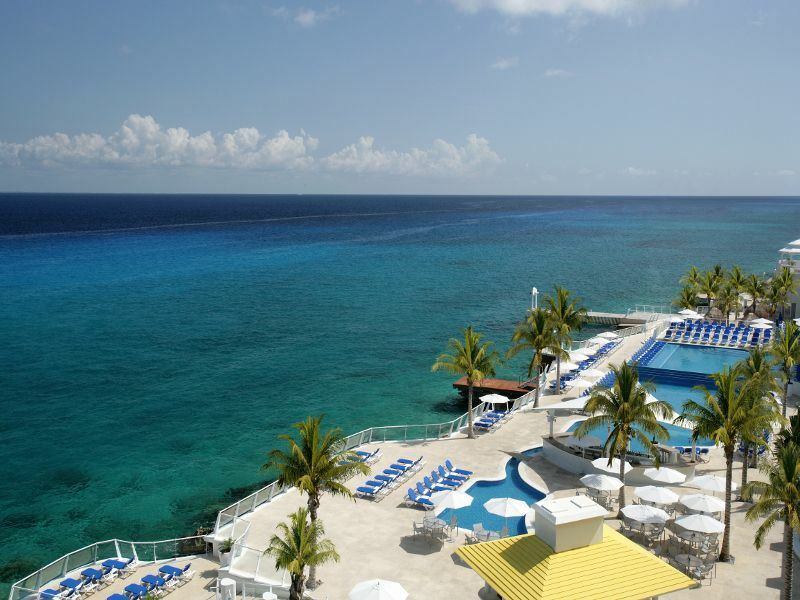 The scene: There’s no shortage of thrills both above and below the water at this high-end getaway in Cozumel - Mexico's largest Caribbean island best known for its incredible snorkelling and diving opportunities, gorgeous beaches, and wildlife-rich mangrove forests. There’s sea-facing pools (one has a kids’ section), heaps of daily activities, and 169 rooms and suites with double whirlpools, private balconies or terraces, and all the creature comforts you’d expect. Best for kids: The supervised kids’ club keeps children aged four to 12 entertained with a rotating schedule of activities focussed around sports, arts and crafts, games, exploration, and adventure. There’s also a lovely playground for little ones, a games room for older children, a special swim-with-dolphins experience (extra charges apply), and regular live performances and themed evenings designed for families to spend quality time together. Best for adults: Life away from the kids can be spent scuba diving and snorkelling, enjoying non-motorised watersports, working out at the state-of-the-art gym, and relishing upscale pampering at the Awe Spa. There’s also variety of pitch-perfect restaurants, including balmy outdoor dining areas, laid-back indoor eateries, and a great selection of late-night bars and lounges with top-shelf spirits, regular live entertainment, and a party-centric vibe.